I have ordered from Diane Before and didn't care for the fit of the jeans usually end up sending them back, kind of wide in the legs. 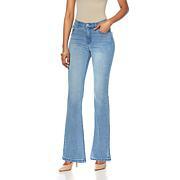 these being skinny jean are just right not skinny tight and the detail on the hem gives them a up to date look. I wear a size 10, and ordered a 10p. I am 5'4 and the length on petite is just right, regular would have been too long. They fit very good. Have been very pleased most of the time when I buy her products. Fit to size could actually go down a size. A little long but cab easily be tuck in. 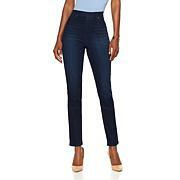 Purchased these in all three colors in my regular size 8 and the fit is beautiful! Plenty of stretch and great weight. Im 57 and length is perfect with any shoe. Cant wait to rock them with the DG high low ruffle back shirt cascading down. You are an amazing woman, Diane! Thank you for designing such beautiful fashions and sharing them with us!